The third-largest law enforcement agency in Allegheny County, providing 24-hour protection for nearly 40,000 students, faculty, and staff. SafeRider provides safe transportation during the evening and early morning hours when special, nonemergency needs arise for Pitt or Chatham students, faculty, and staff. SSS is one of 900 TRIO SSS programs nationwide that is funded by the U.S. Department of Education. 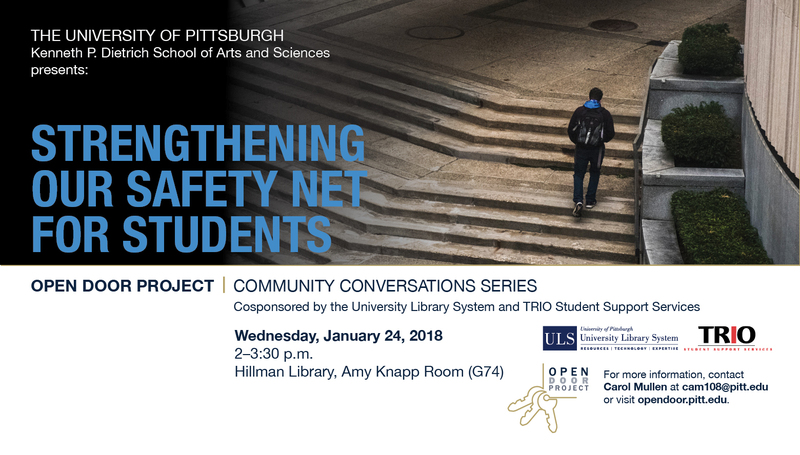 Student Support Services has been available at Pitt for over 40 years and provides academic, social, and cultural support to first generation (defined as parents or guardian not graduating from a four-year institution) and/or low-income college students. Housed in the Kenneth P. Dietrich School of Arts and Sciences, SSS is a program for all undergraduates, regardless of school or major. The University of Thriftsburgh is a student organized thrift store on Pitt's campus. Below is a list of free services and resources available at the library designed to assist students, staff, and faculty at Pitt. Course reserves allow students to check out course readings if they are made available by a course instructor. This page provides instructions and links for discovering if your class text is on course reserve and how to access it. If you have any questions about the library or need research help, please don't hesitate Ask! Questions can be asked via email, chat, in person or over the phone. Equipment available at the Hillman Ground Floor Service Desk includes dry erase boards, laptops, ipads, and noise cancelling headphones. Items check out for 8 hours at a time. Many University of Pittsburgh students face significant financial obstacles to getting their basic needs—food, shelter, healthcare--met. Support is available, but gaining access to it can be challenging. In this interactive session, students, faculty, staff, and alumni who were first-generation college students will discuss the challenges they faced and how their socio-economic status limited their ability to fully participate in campus life. Then, based on the issues identified, attendees will discuss ways to both identify and promote existing services, and create new resources to help fill the gaps. This event was presented by the Open Door Project, TRIO Student Support Services, and the University Library System.